Police in Columbia, South Carolina executed 3 search warrants on Thursday and found more than 2,800 pounds of marijuana and hundreds of thousands of dollars in cash. A traffic stop on Wednesday led officers to conduct a search at the first house where swat team members found 1 suspect with a semi-automatic handgun and a house full of packaged marijuana (pictured). The marijuana was bundled into 20 pound packages and the final weight has yet to be calculated. A second house about two blocks away from the first was searched shortly after, resulting in no marijuana or cash but reportedly contained information that led officers to a third house where they found 4 duffel bags full of cash. Police have arrested 2 people in connection with the case and believe the marijuana is part of a Mexican drug cartel operation. 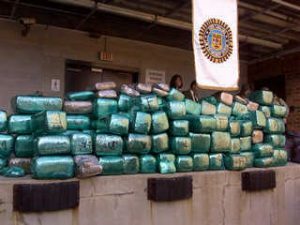 This 2,800-pound bust will not make any appreciable difference in the local supply; nobody will NOT be able to get pot as a result; and the supply chain will remain basically uninterrupted. Translation: Waste of taxpayer money; waste of police time.